Ask me about my weiner, a photo by cgancos on Flickr. This was taken in the lobby of the Rock and Roll Hall of Fame in Cleveland, OH. They didn’t allow cameras in any of the part of the building so I was limited to shooting in the lobby. It was a stage prop for the band Phish. There are cutouts on top of the meat that fold up to reveal seats. According to the description plaque, the band “flew” around the stage in this thing. 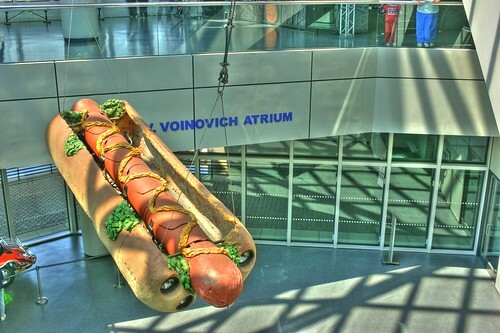 Give it some wheels and you’ve got yourself a wiener-mobile… wait, that one’s already taken, isn’t it? How about a tandem wiener? Bobsled? This entry was posted on Tuesday, May 10th, 2011 at 9:23 pm	and is filed under Uncategorized. You can follow any responses to this entry through the RSS 2.0 feed. Both comments and pings are currently closed.